A fluke or a war crime? U.S. warplanes bombed and destroyed a hospital operated by Doctors Without Borders (Médecins Sans Frontières/MSF) in Kunduz, Afghanistan, on Oct. 3. For 65 minutes, an AC-130U gunship circled the hospital, aiming cannon fire and incendiary munitions at its main building, housing the intensive care unit and operating and emergency rooms. 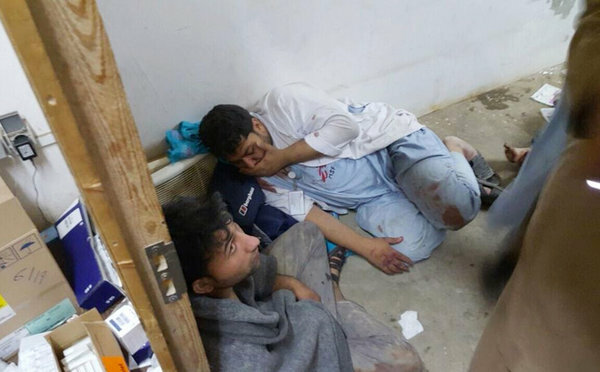 Doctors Without Borders staff members at the hospital in Kunduz destroyed by a U.S. military bombardment. Some 180 patients and staff were inside. At least 12 MSF personnel and 10 patients, all Afghans, were killed; some burned to death. Another 37 were wounded; 33 are still missing as of Oct. 12. To prevent such an attack, hospital staff had repeatedly reported their GPS coordinates to U.S., NATO and Afghan forces. During the bombing, MSF officials called U.S. officials in Kabul and Washington, including the Pentagon’s Joint Staff, pleading for them to stop the airstrikes. But the strikes continued for another 30 minutes. Consequently, MSF left Kunduz. Northern Afghanistan is now without a trauma center to treat war injuries. The aid organization charges the U.S. with committing a war crime in violation of basic human rights, and humanitarian and international law. MSF asserts the bombing was an attack on the Geneva Conventions, which protect civilians, including medical workers, and prohibit bombings of hospitals in war zones. The U.S. ratified these principles in 1955. Hearing a global outcry, the Pentagon changed its story four times. It kept insisting the airstrikes were “accidental.” Now Gen. John Campbell, commander of U.S. forces in Afghanistan, admits the lethal assault was the result of a “U.S. decision made within the U.S. chain of command.” So far the military refuses to provide details. In a rare wartime act, President Barack Obama apologized to MFS. The Pentagon has even offered compensation to victims’ families. This falls far short of earning a pardon for such a heinous crime. MSF strongly repudiates the investigations set up by the U.S., NATO and Afghanistan, and is demanding an independent fact-finding probe of the bombing, under a body set up under Geneva Convention protocols. After 14 years of occupying Afghanistan, the imperialists are still losing. In their desperation, the U.S. ruling class and its NATO allies are ready to commit any crime, violate any international treaty, flout human rights and disregard human life. It’s their standard behavior in the quest for super-profits. Bombing hospitals – nothing new for U.S.
U.S. imperialism is a repeat war crime offender, with a long, sordid history of bombing hospitals and killing injured civilians and medical personnel. These were no accidents. They were acts aimed at terrorizing populations and forcing governments to submit. The record speaks for itself. During the 1950s’ U.S. war on north Korea, U.S. warplanes bombed hundreds of hospitals. Pentagon B-52 bombers obliterated Bach Mai Hospital in Hanoi, the largest medical facility in North Vietnam, during the “Christmas bombings” in December 1972. In Mogadishu, Somalia, a U.N. “peacekeeping force” from Turkey and the U.S. bombed a Digfer hospital in 1993. When the U.S. and NATO waged war to dismantle Yugoslavia, NATO launched cruise missiles against a Belgrade hospital and dropped cluster bombs on a Nis hospital in May 1999 — and bombed four other hospitals. The U.S. invasion and occupation of Afghanistan followed the Sept. 11, 2001, attack on the World Trade Center, ostensibly to pursue Osama bin Laden and al-Qaida. U.S. warplanes then bombed at least six hospitals and clinics in Kabul, Kandahar and elsewhere. In a stunning blow, U.S. planes even dropped a 1,000-pound cluster bomb on a hospital in Herat. In the 2003 “Shock and Awe” bombing campaign against Iraq, Pentagon aircraft bombed a Red Crescent maternity hospital in Baghdad, killing and wounding medics and patients. A year later in Fallujah, U.S. rockets razed the newly built Hai Nazal hospital. U.S. bombs killed 63 staff and patients at the Fallujah Central Health Clinic. With much international support, Doctors Without Borders continues to demand truth and accountability from the Pentagon and Obama administration. More must be done. 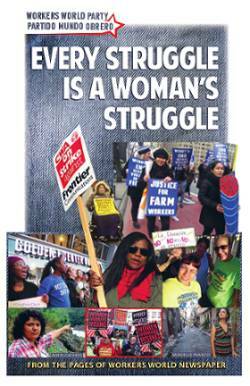 The filthy-rich U.S. ruling class must pay reparations for its war crimes!